Anchorage Alaska’s Camai Bed and Breakfast had an energy audit done for our house this past fall. Our house is undergoing several important jobs to become more eco friendly. 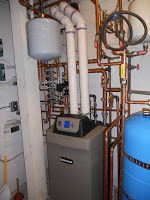 A major part of becoming more energy efficient was installing a Weil McLain Ultra boiler. I suggest to everyone considering a new boiler is that you find a reputable company. Moore Plumbing and Heating in Anchorage has been incredibly good! They worked very long days to get the job done and to do it correctly. Secondly, I suggest having the new installation done in the winter. You will know immediately if something was not done exactly right. We have had two situations we would not have known about if it had not been winter and we needed the heat. The first occurred because two of the seven zone valves were mixed-up. Moore came immediately to fix it. Second problem was not getting heat from a zone valve to our garage. Moore Plumbing and Heating came promptly to fix that. Neither one of these situations would have been evident if we were in the summer months when we did not need heat from the boiler. Now that the boiler installation is complete and working well, we contracted the job of adding insulation behind all the outer walls’ electrical outlets; insulating behind the molding around all of our windows; replacing windows where the double pane is no longer sealed. ; and insulating light cans on our upper floor. This insulation job is not very exciting; however, it will save us considerable energy. We will also be replacing all of our outer doors and weather stripping around them. While all of the outer doors have storm doors, replacing the doors will save substantial energy. These are the major energy saving jobs we have contracted to have done at times when they will not impact our bed and breakfast guests. Fall 2011 we will have our second energy audit and expect to have greatly improved our efficiency.